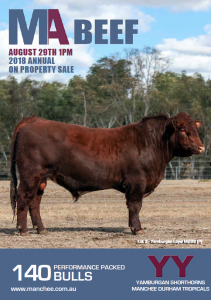 The 2018 bull sale was be held on Wednesday, 29th August 2018, with purchasers travelling from all states of Australia (excluding WA) as well as a yearling sire being purchased by New Zealand clients. Of the 118 homozygous poll tested sale draft offered by Manchee Ag, 104 sold for an 88 per cent clearance and $6067 average. A further sale break down of the sale saw 68 of the two-year-old bulls average $5750 with a top at $17,000 while 16 yearling bulls averaged $6937 and topped at $18,000. Queensland buyers competed strongly for the Durham Tropical bulls with 20 of the Santa Gertrudis infused sires averaging $6450 to top at $12,000 (twice). Repeat buyer Peter Caskey, Little Ampi, Mt Gambier, South Australia, secured the $18,000 top priced Yamburgan Spartan N42. The polled 17-month-old son of Yamburgan Spartan K442 weighed 686 kilograms with an eye muscle area of 105sq cm, P8 and rib fat depths of 12 and seven millimetres and intramuscular fat of 6.2. The young sire was out of repeat top price bull breeding dam Yamburgan Mayflower H105, the young sire had estimated breeding values (EBV) in the top one per cent for scrotal size, carcase weight and domestic and export maternal indexes. The light birth weight bull also had a +76 EBV for 600-day weight. His new owner and commercial Shorthorn breeder, Mr Caskey, was one of the fortunate buyers on sale day to have bulk feed on his property. 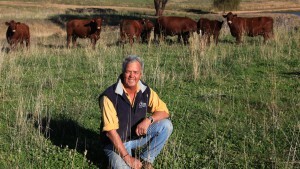 Mr Caskey turns off 400 to 500 kilogram grassfed cattle to JBS with high marbling and good growth for age a focus in his operation. 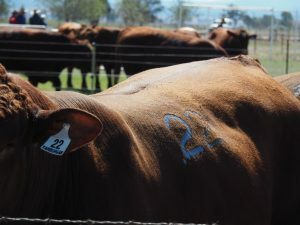 The second top price was reached early in the sale with Stuart Brownlie, Deepwater, Westmar, Queensland, paying $17,000 for lot three, Yamburgan Loyal M289. The 25-month-old polled son of Marellan Loyal had a 132sq cm EMA and was the heaviest in the catalogue at 920 kilograms. 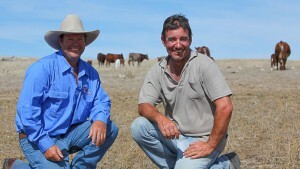 Mr Brownlie runs a commercial Shorthorn operation and fattens stock to supply export markets. 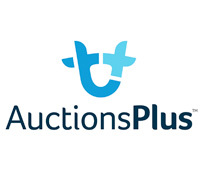 Meanwhile, repeat buyers the Syme family, Waipuktau, New Zealand, successfully purchased Yamburgan Gigabytes N4, a son of 15 year old ET donor Yamburgan Margaret 31st. The yearling sire is in the top 10% for milk, scrotal size, EMA, top 15% for days to calving, carcase weight, IMF and top 20% for 200 day weight, domestic & export, and maternal indexes. A bull with exceptionally well balanced figures. 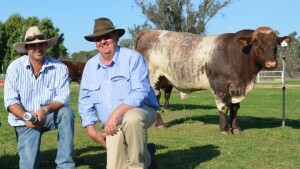 Queensland repeat and new client support saw two Durham Tropical bulls top at $12,000. Mitchell producers Angus and Sally McGilvray paid the $12,000 top price first for Manchee Dunkirk M1004, described as one of the best Durham Tropical bulls the Manchee family had ever offered. He was one of three purchases for the couple, which averaged $10,333. Bill and Belinda Gordon, Begonia Station, St George, also paid $12,000 for Manchee Dunkirk M1030 who was DNA tested homozygous polled with a tenderness score of four. The couple purchased four Durham Tropical bulls averaging $7750 to integrate into their mixed breed herd including Shorthorn, Santa and black breeders. 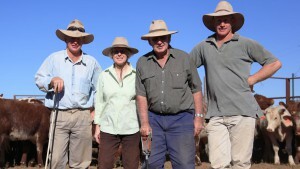 The demand from interstate buyers expanded into the Northern Territory with Mulga Park Station, Alice Springs, the bulk buyers of 12 bulls averaging $4454. Recognising the impact of the tough seasonal conditions, there was still strong support from buyers, a large percentage of them repeat clients. 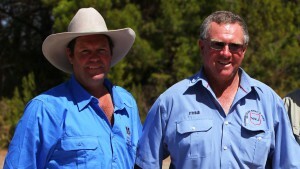 John told the crowd prior to the sale that by the time progeny were born from their Yamburgan sale bulls, the past drought conditions would have spurred record beef prices making them worthwhile investments. “What I do find in years like this is that our clients can get into some really top genetics and so it boosts everyone’s gene pool,” he said. Manchee Ag would like to thank everyone for their support on sale day. All bulls in this years MA BEEF bull sale have been tested for HOMOZYGOUS POLLEDNESS with results available on the supplementary sheet. More than 50% of the sale offering has been DNA tested homozygous poll. We are very impressed with the line of calves by General H188, he has blended very well with our existing sires. 2018 will also see another impressive line of bulls by Y Zeus H140, with some of the top sire prospects by him. Manchee Agriculture strongly believes data accuracy and the entire 2016/17 drop of bulls, heifers and steers have been scanned and carcase data submitted to Breedplan. This enables you to have access the breed’s highest indexing genetics, with more the 90% of this year’s catalogue ranking in the top 25% of the breed for either Domestic, Export or Northern Indexes. 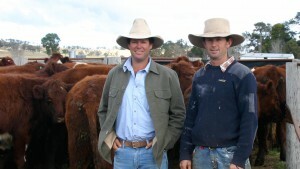 Manchee Ag genetics have been successful in steer trials, with wins in the RAS Beef Challenge 100 day Competition (1st, 2nd & 3rd for profitability) and the ANZ Beef Australia Carcase Competition (MA steers placed in every class entered). Click here for the 2018 CATALOGUE. Click here for the 2018 SUPPLEMENTARY SHEET.